The sinking of the Titanic, now over one hundred years ago, is still one of the most famous disasters in history. So it is no wonder that it has been the subject of countless books and films. Given this, the question has to be whether there is the appetite for yet another novel exploring this incident. The answer, strongly given by David Dyer in his debut The Midnight Watch, is an unqualified yes. 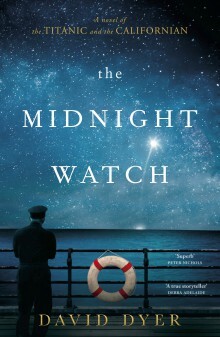 The Midnight Watch is not primarily the story of the Titanic itself. Its focus is on the SS Californian, the ship closest to the Titanic on the night that it hit the iceberg. The Californian had stopped due to the pack ice and its radio operator had warned nearby ships, including the Titanic, of the danger. The second officer, on the midnight watch, saw white rockets, traditionally a distress signal, coming from the distant ship, which he had not identified as the Titanic. He reported his observations to his captain who did not order any response and so the Californian did not do anything to respond until the following morning. The question that emerged later, and that David Dyer explores, is what stopped the Californian going to the Titanic’s aid? Dyer explores this question through a fictional reporter, John Steadman whose expertise is writing about the victims of disaster. Steadman is not interested in the survivors of the Titanic but in the dead who, he assumes, have been picked up by the California. He finds no bodies on the Californian but senses a deeper mystery, and an earlier trauma pushes him to pursue the story until he is satisfied with the answer. Dyer has a deep knowledge of the Titanic disaster and the inquiries that followed. He uses the transcripts of these inquiries give this historical investigation significant weight. But what he is trying to do is get behind the words, to shine light on the crew of the Californian – in particular the second officer on watch and his captain – and discover why they held back when another ship was so obviously in distress. Dyer is never definitive, providing theories from an observer’s perspective. He holds holding back from directly imputing any motive to the men themselves, leaving the reader to make up their own minds. In the end, Dyer has his cake and eats it too. A lengthy coda, written by Steadman partly as a way of exercising his own ghosts, takes the reader back to the Titanic on the night of the disaster. This section, designed to tug at the heart, serves to put the legal wrangling, the dissembling and the moralising into perspective. Fifteen hundred people died when the Titanic sunk, many of them children and third class passengers. Dyer makes sure that they are not forgotten.